I long ago lost count of the number of courses on boys’ reading that I’ve given. A perennially important topic. It’s well known that boys fare less well on average than girls at reading tests, and like reading less. NFER has produced an interesting PDF on boys’ reading. We learn that boys tend to do well at questions requiring no writing, but much less so when asked to construct their own answers and produce extended responses. This particularly applies to questions that call for an understanding of characters. Boys’ preference for the non-fictional extracts used in tests over the fictional ones is clearly significant here. So surely is the fact that on average they read less than girls. I am delighted that NFER’s first suggestion for getting boys reading is leading them to the library. As they say, the library should display books that are likely to engage reluctant readers prominently. Other recommendations are for book clubs (I know of lots of cases where book clubs have totally changed boys’ views of themselves as readers); choosing books with boy appeal (this is already happening in most schools I know, sometimes overwhelmingly so); and setting a good example. Being seen reading by children makes a big difference. It is also vital not to stereotype boys, as recent research from the University of Kent shows. Boys’ learning and achievement, including in reading, are hampered by stereotypes about boys’ abilities. I’m convinced that fundamental to the issue of boys’ reading is our notion as a society about what reading is: what makes a reader. If boys get the message from their schools, politicians, the media, their parents, that a ‘good’ reader is someone who reads lengthy novels, preferably with no pictures, thousands will feel from the outset that they cannot succeed. Without doubt boys need and deserve excellent libraries, exciting books, good reading promotion and effective role models. They also need and deserve organisations that challenge the prevailing culture. When that happens, as it does in many schools such as Oxford Gardens, where I took the lovely picture of boys engrossed in information books, attitudes change. 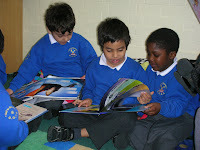 I’ve written quite a few blogs about boys’ reading. You can find them all by entering ‘boys’ into the search box on the right. It’s also well worth reading Alan Gibbons’ recent blog about getting boys reading. Practical ideas for changing the reading culture in schools.